The Raspberry Pi is an extremely low-cost yet highly capable Linux platform. It can be a very nice platform for a small security tool. OpenVAS is an open-source fork of the Nessus project. It is a sophisticated vulnerability scanning tool, with a large collection of publicly maintained test libraries plus the ability to write your own tests in the NASL scripting language. While my examples and screen shots are from a Raspberry Pi, this page explains how to set up and use OpenVAS on any platform. We need to install the needed software packages. Then, generate a server certificate and add a user, but we only have to do these two steps the first time. Then, update the plugin list and start the scanning service. Be patient, the enormous library of vulnerability scanning plugins makes those two steps take a while! Then we're ready to start scanning our network for vulnerabilities! Install the openvas-server package This will also install the needed plugin packages openvas-plugins-base and openvas-plugins-dfsg, and the needed library packages libopenvas2 and libopennasl2. You also need to install openvas-client somewhere, but it doesn't have to be on the same platform. 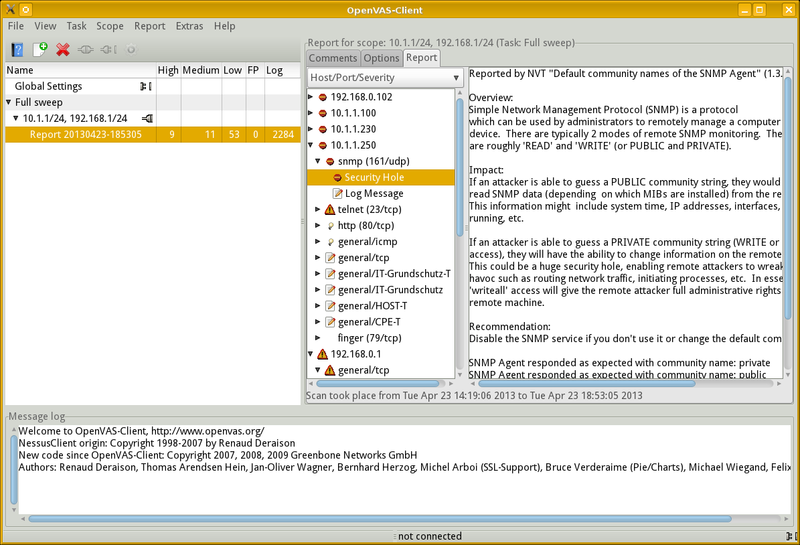 The OpenVAS scanning engine, known as the server, does the work of probing the network and testing nodes you want to scan. The management console, known as the client, can run on another machine and connect to the server across the network. Those are the package names on the Raspbian and Mageia distributions. On other distributions you may find it packaged differently, or you might even need to build it from source. Communication between the server (the scanning engine) and the client (the management console) is secured with SSL. You need to generate a certificate for this. Use the openvas-mkcert script. I will assume that you have tired of typing sudo before every single command and you have simply run bash or some other preferred shell through sudo. daemon will be able to retrieve this information. A user account needs to be defined on the server. Again, there is an easy-to-use script for this. Note that the user name does not need to correspond to any existing Linux user, and the password defined here is useful only for authenticating to the OpenVAS server process. You can ask for certificate based authentication, and specify a user certificate for the user. that cromwell has the right to test. The above command will require a significant amount of time as it will download and install tens of thousands of security plugins. Maybe 15 minutes or more even on a cable modem as over 300 megabytes of plugins are downloaded and stored under /var/lib/openvas. Let's start the scanning engine! You may see an error or two, caused in these cases by overly wordy vulnerability test designers. Again, given the size of the collection of plugins, expect this to take a while to get started. You clearly do not want to put this into a startup script unless OpenVAS scanning is the only purpose for your Raspberry Pi, or unless you start the daemon in the background. freebsd_chromium.nasl: The length of the value for the property "cve_id"
characters, maximum length is 3192). characters, maximum length is 512). gb_VMSA-2012-0005.nasl: The length of the value for the property "name"
I will do this from my desktop workstation. It is time to define a new task. Select Task | New or simply click the New button, appearing like a white sheet with white/green "+". Then click "unnamed task" and change it to something meaningful. This is simply the name of a scanning task. We need to define what it will do. Select Scope | New. Then click "unnamed scope" and change it to something meaningful. With your named scope selected, click File | Connect. The following dialog will appear with the hostname set to localhost by default. Change that to the DNS name or IP address of your OpenVAS server platform, then enter the login and password for your scanner user. Once again, be patient! The SSL connection and authentication actually happen very quickly, but the console doesn't refresh and you can't see that it is busily cataloging over 30,000 plugins. This is a case where it is a good thing when the client console appears to be "frozen". Running top on the server will show that the CPU is about 40% busy with the openvasd process. Eventually an information box will pop up announcing the number of enabled plugins, and the console window will refresh. Click "OK". A list of dependencies will be transferred much more quickly, with the window refreshing and keeping you informed. You will see the tree of plugins at upper right, click the triangles to expand that node in the tree. You can see here that I arbitrarily named my task "Full sweep" and its scope "10.1.1/24, 192.168.1/24". Yes, the scope name serves as a reminder to me of what ranges of IP addresses it will scan, but the name is arbitrary. I still need to tell the scanner what targets to use. First, though, let's go to the General category. We find that the scanner will use Ping and the OpenVAS TCP scanner for port scanning. Since my targets include some routers and VLAN switches, I will add the scanner based on snmpwalk. I will also change the settings for "Hosts to test concurrently" and "Checks to perform concurrently." By default they are 20 and 4, respectively. 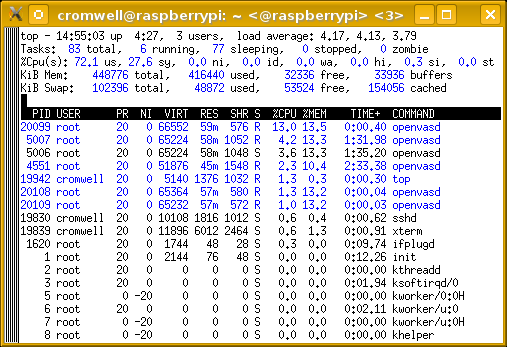 But remember that the Raspberry Pi has just one CPU, not terribly fast, and 512 MB of RAM. No good will come of a load average above 35! I will dial these settings back to 2 and 2. Next, go to the Credentials category. We need to configure SSH authentication so local tests can be run. 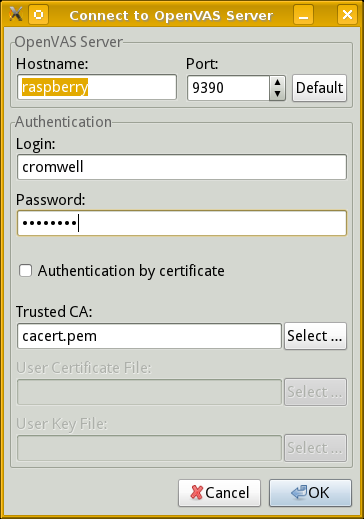 I have specified using my existing account cromwell and authenticating using an SSH key. See my pages on SSH configuration for details on how to generate and use SSH keys. Select the Target selection category, and provide a list of target hosts to be scanned. I have manually entered a list of IP addresses. Notice that you can read a list of hostnames or IP addresses from a file, or you can do a zone transfer from a DNS server. Expect to see a rather busy processor on the system running the scan, whether it is a Raspberry Pi or a high-end notebook or desktop. Here I'm running it on a single-core Raspberry Pi Model 1. The last 4% or so of the checks for a host may seem to slow down if you are only watching the progress bar and the host is running SSH and HTTP/HTTPS. Use tail -f to follow the ends of the log files /var/log/authlog and /var/www/logs/error_log or similar on the current targets. You will observe a lot of relatively slow SSH default password guessing followed by HTTP testing. You may need to disable intrusion detection systems on the target hosts to make the tests most meaningful. Even with IDS turned off, your logging will become rather noisy during the test. The top output at right shows that configuring the server to run two tests on each of two hosts concurrently has yielded a load average close to 4. That's what we should expect. This looks good — the CPU never is idle, but at the same time it almost never is forced to wait while it is blocked for I/O because of overly aggressive paging. And we aren't swapping, which would be far worse! The report is presented as an expandable tree. Click on the triangle beside an IP address to expand its report, and so on for the protocols and other details. Above we see the report details for host 10.1.1.250, the SNMP protocol running on UDP port 161, and some explanation about what was found. The report can be exported in NBE, the native Nessus format, or in XML, HTML, LaTeX, ASCII text, or Postscript. See the OpenVAS documentation for all the details on using OpenVAS.